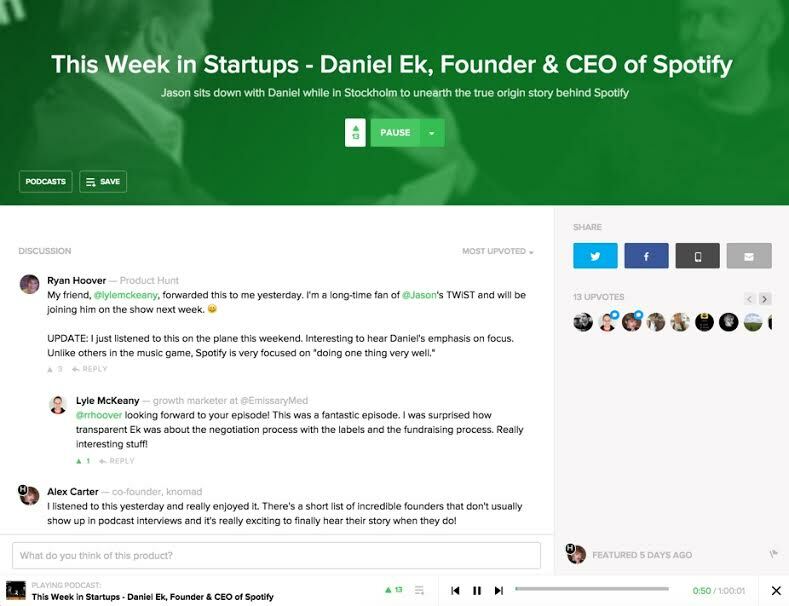 Product Hunt is continuing its expansion of channels, this time with podcasts. But it’s not about the actual podcast show so much as certain episodes of those shows that will be added to the list for upvoting. The new listing offers an opportunity for the Product Hunt community to chat about particular episodes with other podcast fans and the hosts themselves – something missing in other podcasting networks. Will the podcast discovery channel display the same chatter as other categories on the site? Product Hunt has had success in discussions of popular tech product launches and AMAs with creators of those products. The Live channel, a place for Reddit-like discussions with people of notoriety such as venture capitalist Aileen Lee and author Tim Ferris, have fared well. However, the Books and Games channels have seen fewer upvotes and not as much discussion. Both are still in beta and therefore not open to the public. These categories most likely see less participation for that reason. Hoover is aware of the lack in these channels and told TechCrunch a redesign of the site is currently underway to remedy that. “Frankly, Games and Books haven’t received as much love in part because they’re buried within another tab,” Hoover said. “We’re working on a big redesign of Product Hunt right now to incorporate Games, Books, and Podcasts on the front page. Hoover shared a blurred-out mockup of the new design in a Medium post earlier this month, questioning whether he should share what he was working on or not. Part of the new design will include content that better represents the books and games medium, such as videos of the actual video games. Product Hunt could even include some live gaming, according to Hoover. “That’s what gamers are asking for and we believe video is one of the best ways to show what a game is like,” Hoover said. The young founder also told us the community had been asking for a separate space for adding podcasts and discussing them. Podcasting seems to be on the rise. The medium reached a breakthrough moment with the introduction of the 2014 podcast hit series Serial – a reinvestigation of the 1999 murder of Maryland high school student Hae Min Lee. According to Pew Research, podcasting is hitting a new peak. Just 11 percent of the population age 12 or older listened to podcasts in 2006. That number has tripled in 2015, to nearly a third of the U.S. population. Several media outlets such as TechCrunch, Re/Code and the New York Times have taken note and added their own podcasts. “By making each episode sharable and discoverable, Product Hunt Podcasts mirrors current events and today’s conversation in audio form,” Hoover said. But online discussions of these podcasts have so far been limited to Facebook friends and 140 character tweets. 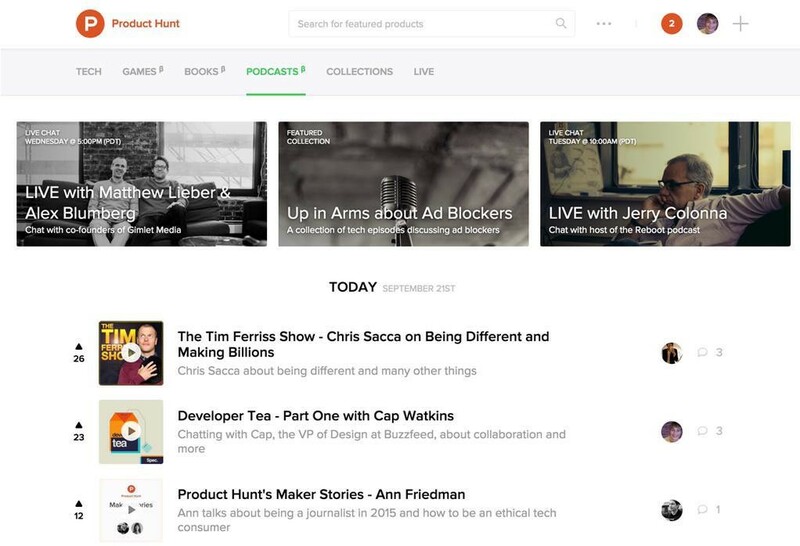 Hoover believes the addition of podcast episode discovery on Product Hunt will give the podcast community a place for that discussion. “I’m also a huge podcast fan, so we built this for me, too,” he added. I come from a radio and podcasting background and am an avid listener of several shows from the tech community and beyond. I listened intently to Serial and read every article and discussion about it I could find. I am personally looking forward to a section of the Internet where I can discuss and discover new shows. We also have several great podcasts created by TechCrunch reporters and editors such as the Gadgets and Bitcoin podcasts – and the incomparable Alex Wilhelm’s newest show, Bullish – which we repurpose into a podcast. I highly recommend checking those out when you get a chance.